It’s not really the place of the S&G to comment upon every personality who passes away. Sadly, from the perspective of 2016, any interest in the first half of the 20th century means reflecting upon lives and achievements that reach their end on a regular basis. Obituaries for S&G luminaries such as John Coombs, Sir Jack Brabham and Les Munro have been well written and doubtless read by regulars here; there is no point repeating for the sake of it. 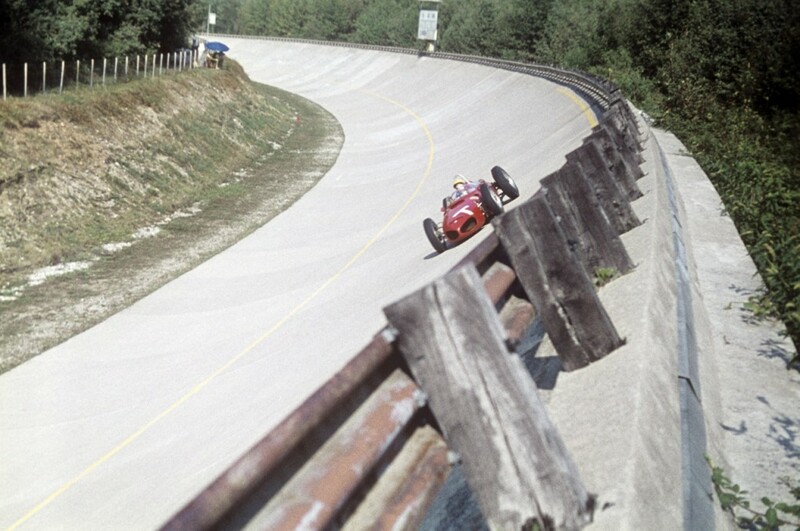 But the recent passing of Maria Teresa de Filippis has robbed our generation of a unique link with that rather wonderful world of Formula One in the 1950s. She was glamorous, she was brave and she could certainly drive a bit. Maserati encouraged her and she joined the glittering set alongside Fangio, Moss, Hawthorn, Collins, Brooks ,Musso and all the rest: the right girl in the right place at the right time. 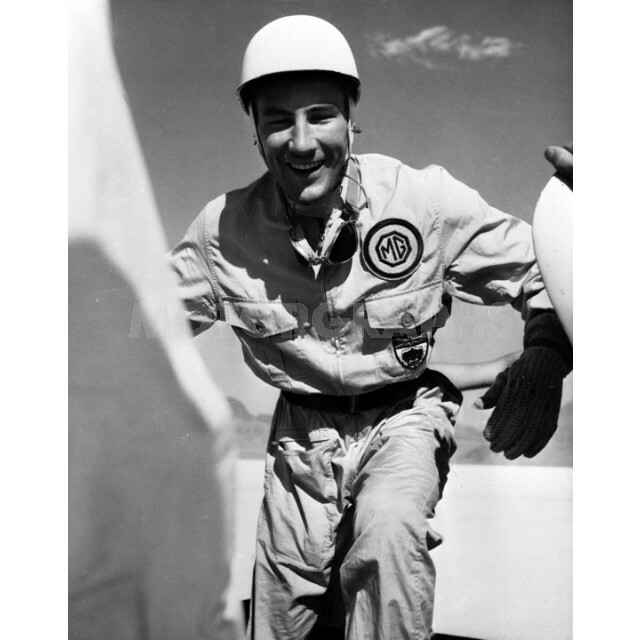 The summer of 1957 was an incredible period in Sir Stirling Moss’s illustrious career. 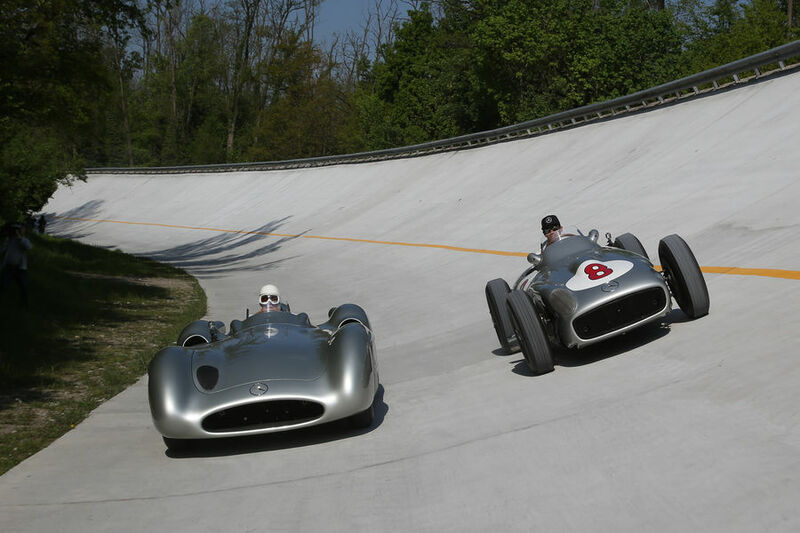 He had finally got a British car worthy of his talents for Grand Prix racing in the form of the Vanwall and with it delivered three victories – the first for a British car and driver combination in the world championship’s history. That the first race win came at Aintree in the British Grand Prix was also a boon. The second win came at Pescara, a majestic and terrifying open road circuit – the last time that a world championship event would be held on such a traditional layout in Europe. Then, days later, Stirling hopped gamely on a plane and set off for the United States. The reason was that he had been engaged by another British brand to fly the flag – M.G. With the launch of its MGA in 1955, M.G. moved away from its familiar ‘square rigger’ sports cars such as the TD and TF and instead produced a modern, streamlined beauty with no echoes of pre-war design to be found in her. This had proven to be something of a shock to the marketplace… so honours needed to be won. The MGA’s twin-cam 1500cc engine was duly mated to a supercharger which was almost exactly the same size as the basic powerplant, and its technical guru Syd Enever juiced it up on a special fuel mix of 86% methanol laced with nitrobenzene, acetone and sulphuric ether. The result was a rather manic unit that generated 290bhp at 7,300rpm. 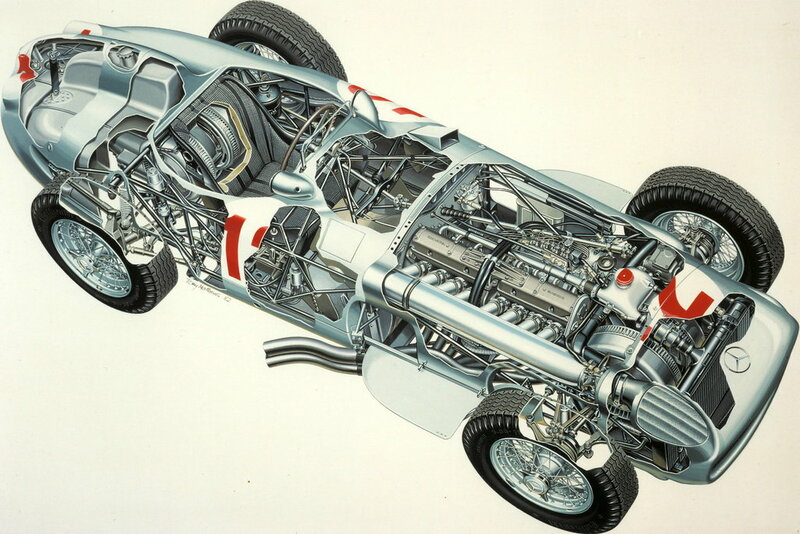 This remarkable engine was placed in a dramatic setting – mid-mounted in a spaceframe chassis that was then wrapped in an extreme form of aerodynamic bodywork. Commonly referred to as looking like a tadpole and given the nickname ‘rolling raindrop’ the EX-181 was an extraordinary thing. The complete car measured 15 feet long and only three feet high, requiring the driver to lie down underneath the steering wheel. It had been tested by the promising young American ace Phil Hill, who warned Moss to be particularly careful when slowing down, as the cockpit was liable to fill with toxic and highly inflammable fuel vapour so it was best to hold your breath and go easy on the brakes! On 23rd August, at the Bonneville Salt Flats, Moss hopped inside the car and its bodywork was latched down over him. He then proceeded to shatter no fewer than five records in the 1100-1500cc class over 1km, 1 mile, 5km, 5 miles and 10km – with his fastest run being clocked at 245.64mph. This was more than 20% quicker than the previous record, and comfortably made EX-181 the fastest M.G. yet built. The dynamic young Englishman and his futuristic-looking steed took the world by storm, and M.G. saw its fortunes take a great leap. 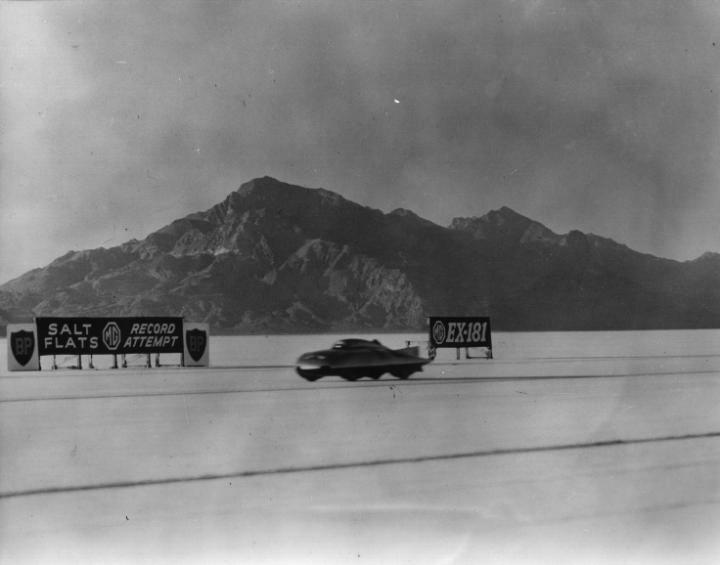 It would later add another 10mph to EX-181’s top speed and set new records with Phil Hill at the wheel, but in the summer of ’57 it was Stirling who was the fastest man in the world. Three weeks later he won the Italian Grand Prix at Monza in Vanwall’s final triumph of the summer. For his combined achievements in racing and record breaking, Moss was awarded the Royal Automobile Club’s prestigious Segrave Trophy. Today EX-181 stands as one of the most prized exhibits in the Motor Heritage Centre in Gaydon, where her outlandish looks still attract considerable awe and interest from subsequent generations.